FOX seems to be trying to purify itself, today. In addition to cancelling Lucifer after three seasons, the network has also cancelled The Exorcist TV show after a two-season run. It seems they can’t give the Devil his due and pay Tim Allen, too. 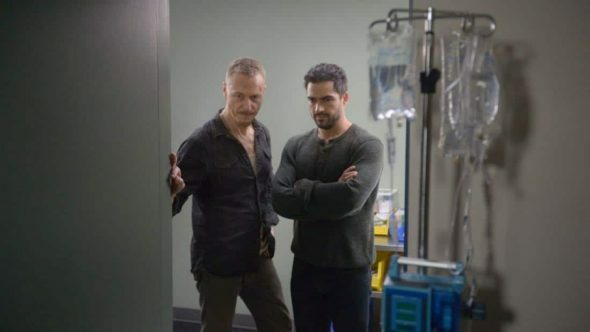 An anthology drama, The Exorcist follows Father Tomas Ortega (Alfonso Herrera) and former priest Marcus Keane (Ben Daniels) as they uncover evil. The season two cast also includes Kurt Egyiawan, Zuleikha Robinson, John Cho, Brianna Hildebrand, Li Jun Li, Christopher Cousins, and Cyrus Arnold. Ratings have always been low for The Exorcist and it looks like season two was the final nail in the coffin for FOX. Overall, the season averaged a 0.41 rating in the 18-49 demo and 1.322 million viewers, and was down by more than 30% in both measures, in comparison to the first season. The Hollywood Reporter has confirmed The Exorcist cancellation, as has show creator Jeremy Slater. Check it out. What do you think? Did you watch The Exorcist TV series? If it were up to you, would FOX have cancelled or renewed this TV show for season three? Jessica Pena contributed to this report. More about: FOX TV shows: canceled or renewed?, The Exorcist, The Exorcist: canceled or renewed? Who is using the company brain cell at the moment? Hopefully they change their minds. very disappointed, really looked forward to season three! It was a well done show!